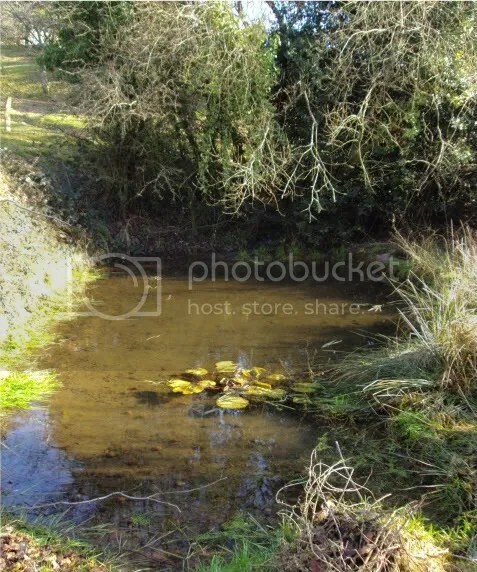 The wildlife pond – as I’ve explained elsewhere – is fed by a spring which rises in a neighbouring field. It’s a remarkably clear pond though it does occasionally suffer from duck weed or, in a hot summer, algae. The algae problem we solved with a couple of bales of barley straw… solving the problem of the barley plants which have sprouted from barley seeds imported with the straw is a whole different issue. Duck weed can be removed fairly easily and effectively though it is time consuming. But also kind of relaxing as you stand and scoop, check for pondlife, particularly the tiny, spiral shelled snails, and return them to the water. It’s a time when I often notice newts moving about on the bottom of the pond though they seem to have some sort of sixth sense: they’re hidden under a leaf or in the silt by the time I’ve picked the camera up. The stream trickles in at the far end and exits via a surface level (then underground) pipe half way along on the right-hand side. There are trees around it (brambles on the bank on the left) and the silt level is gradually rising which puts us in a bit of a quandary. When do we clear it with least damage to the wildlife? 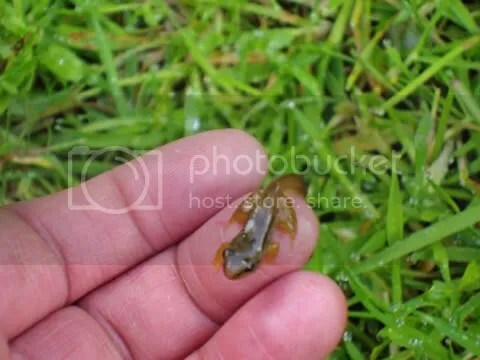 We did some work on it late last summer, after the tadpoles and done the metamorphosis thing and graduated to frogs (and possibly toads) and we disturbed a lot of pond snails, dragonfly / damsel larvae, newts large and small. Removing the pond weed and the vigorous barley seedlings – which were about half-a-metre in height – may well have removed some of the eggs laid by dragon and damsel flies and newts – but no time of the year seems the perfect time to carry out maintenance work. As it was – late September, 2010 – we disturbed frogs, newts and quantities of dragonfly larvae while we cleared unnecessary foliage. This was unfortunate of course but it certainly brought home to us that we have created a very healthy environment for these creatures. 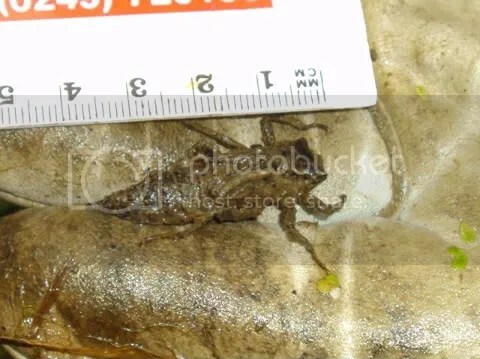 We found a dozen or so larvae of this size and I’m guessing – judging from the exuvia I found last June – that this size is likely to emerge to change into a dragonfly this coming summer (2011). Smaller dragonfly larvae were collected off the strands of barley grass and popped into a bucket while we weeded the pond. They were put back when we’d finished and they were no longer at risk of being stood on in the silt. I wondered whether the size discrepancy was just age related (obviously they hatch from tiny eggs so grow / moult / grow over several years) or whether we had a damselfly larva here. Having checked how each type of larva looks in the early stages, dragonfly larva / nymphs seem to have a broader bum than damselflies so I think these are dragonfly larvae. We do have plenty of damselflies flitting around the pond though, and I have seen them in egg-laying mode… as well as mating… so I’m sure that are damselfly larvae in the pond too. However, with the age range in the pond, life is distinctly dangerous for smaller larvae as they will be snacked on by the larger ones. 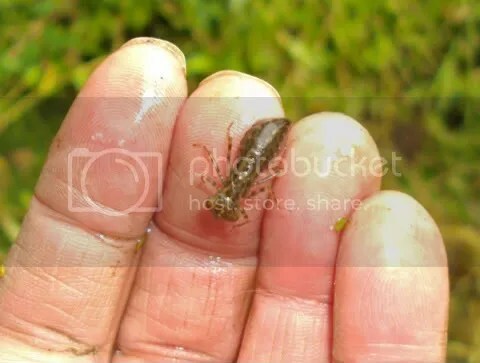 And the increasing population of larger larvae may explain why we saw far fewer froglets emerging from the pond last year compared to 2009. These larvae are ferocious predators and the serrated mouth parts (which shoot out of the mouth to better grasp their prey) were the basis of the design of the alien’s mouth parts in the Ridley Scott, Sigourney Weaver Alien films. 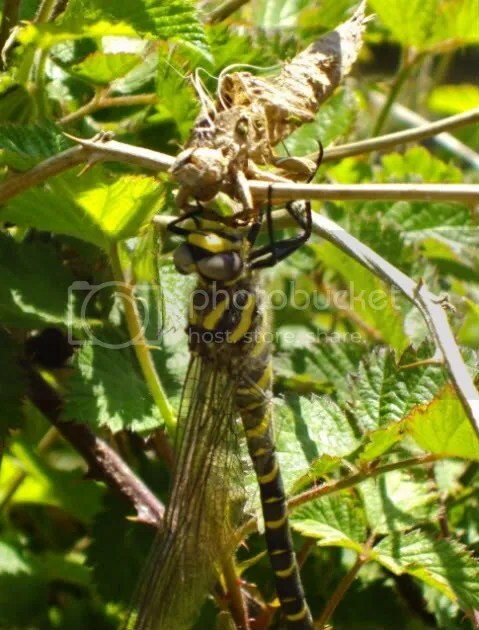 This is probably the largest dragonfly in Europe and can spend 6 or 7 years in the larva form… followed by just a couple of months as a dragonfly. It is beautiful. 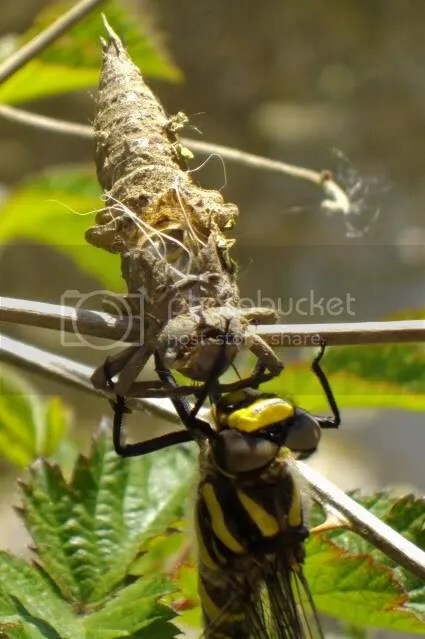 The “casing” splits along the back, the dragonfly arcs out of the casing, almost doing a somersault, and hangs for several hours, ideally in the sun, until the body and wings harden before it flies away for the final stage of it’s life. So this June, I’ll be lurking down at the pond during the early morning in the hope of seeing the nymphs climbing from the pond ready to emerge from their casing as fully grown dragonflies. In a day or two… damselflies. http://www.dragonflysoc.org.uk/home.html – the Frequently Asked Questions are particularly interesting and well-written.